Our second installment of staff picks features a variety of high-quality products. Even the youngest children can learn to play piano with Piano Pals from Schoenhut Piano Co.; Smart Mom LLC offers a product that is stylish for Mom and yummy for baby; and Worx Toys Inc. provides kids with a look inside their toys with the Inferno Fire Truck. See these exciting products, and more, below. 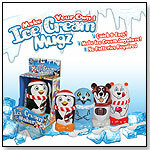 The Frosted Ruff N' Ready pack contains ten 8"x10" sheets of the exclusive Frosted Ruff N' Ready Shrinkable Plastic. It's the plastic found in kits and books produced by Spin Master, Curiosity Kits, and Klutz. This plastic is actually clear plastic that has been machine roughened on one side. Recommended for use with children because colored pencils can be used to trace and color one's selected image. The sheets are unprinted, to be left up to the imagination of the user to fill in. These donut- and heart-shaped pendants mimic real gemstones and hang on a black, silk cord with a breakaway clasp. The jewelry is made from a food-safe, phthalate-free, non-toxic, lead-free, federally approved silicone, so it is safe for babies to handle and chew. Eight colors are available. Teething Bling makes “a great shower or new baby gift,” Director of Marketing Amy Maurer Creel of Smart Mom told TDmonthly. Awards: TDmonthly Innovations 2008. Launch date: October 2006. This iridescent dolphin necklace is available in pink, blue, purple, and white pendants. Each pendant also has its own matching cord. The bink'd collection of temporary tattoo earrings can be applied quickly and easily with water, in as little as 15 seconds. The tattoos are made in the USA with FDA-approved, vegetable-based inks and adhesive. When applied correctly to ears, bink'd tattoos are designed to last five or more days. Multiple designs are available. Sticky Mosaics Owl Pals comes with 4 sparkling projects, 4 plastic wall hangers and over 2500 sparkling tiles and jewel pieces. Follow a simple numbered legend and stick on the colorful tiles and jewels to create a stunning masterpiece every time. This no mess, no fuss kit features little owls peeking out of trees, snuggling under the moonlight and reading a book. "Sticky Mosaics are not just crafts; they are works of art! Just because a craft is completed doesn't mean the fun is done; display these mosaic masterpieces for years to come with the special wall hangers included in each kit," Stephanie Carver, from The Orb Factory, told TDmonthly. — Retailers surveyed by TDmonthly have been naming The Orb Factory's Sticky Mosaics kits as a best-selling line since 2009. — In late Spring 2011, 25% of retailers surveyed said Sticky Mosaics were their best-selling line of activity kits. 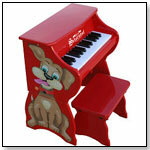 This versatile new little piano grows with your child! The main unit, decorated with a whimsical animal’s head, is perfect for toddlers because it sits safely and squarely on the floor within easy reach of little hands. Later on, the sides with the animal’s body can be attached, conveniently raising the piano to a comfortable upright height for an older child seated at the bench. Schoenhut toy pianos are noted for their excellent quality and unique chime-like tones. The width of the keys promotes proper finger placement, enabling an easy transition to a larger piano. Children will have a blast building and racing on this fast and fun Techno Gears Marble Mania Twin Turbo Trax. After completing the build kids can compete against each other as they race their marbles through this exciting turbo marble speedway. Fun sound effects add to the excitement and the winning time shown on an LED display. Colors may vary. Requires two "AA" batteries and two button cell batteries. "We manufacture the longest running marble run on the market, " Sherri Borrelli, Sales Administrator for The Learning Journey International, told TDmonthly. Launch date: May 2011. Box-O-Mania puts a modern twist on the traditional cardboard box - the inspiration behind imaginative play and creative learning without complicated instructions and power charges. Inspired by this timeless toy, Box-O-Mania play boxes and specially-designed reusable stickers provide kids with the creative space in which they can use their fantasy through a variety of themes: a fire station, a beauty salon, a home, a clubhouse and more. Made of lightweight, yet sturdy corrugated plastic, Box-O-Mania play boxes offer more than twelve square feet of interior space for up to three children; they are easy to assemble, convenient to transport and store away. — "My daughter is going to love this one. Fun, interactive child sized houses made from correlated plastic panels that velcro easily together. Available in 4 colors and several different themes. Use dry erase markers or the included sticker collection to decorate and personalize. When your done, wipe it off and start anew. 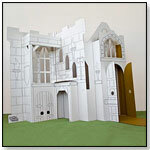 Great for imaginative play," Jennifer Shuman, of 1SmartNoodle, told TDmonthly at Toy Fair 2010. The Executive Marshmallow Shooter holds 25 miniature marshmallows in its magazine chamber and fires up to 30 feet accurately. 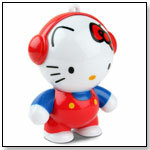 MOBI HeadPhonies Hello Kitty by MOBI Technologies, Inc.
HeadPhonies are portable mini speakers shaped like designer toys. They are compatible with all iPod variations, and will also work with other MP3 and CD players, as well as computers, handheld video games and even certain cell phones. The speakers stand at only 3” tall, and are designed with high sound quality in mind. Each HeadPhonies includes a cable for connecting a music library as well as a charging cable for the internal battery. The internal battery can be charged in about an hour with a playback time of over four hours per charge. "The MOBI HeadPhonies provides the sound of a Boom-Box with the cute design of Hello Kitty," MOBI Technologies National Sales Manager Andrew Buckband told TDmonthly. 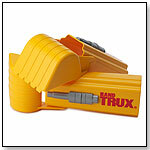 HANDTRUX®, a BRAND new, made in AMERICA toy line of safe, imaginative, hand-operated construction vehicle toys. To be released first: the HANDTRUX® Backhoe, along with a film documentary, “Zapped by a Dream: How to make a toy in America” and an original rock music CD by Rough Embrace, “Crush on You.” These unique sandbox sized dirt machines look and work just like the Big Iron, kids can really do precision digging for hours of unstructured playtime. “This is a new twist on a time-treasured category: sand toys. Unlike previous offerings, these are toys that you wear, incorporating the patented, amazing ‘handraulic’-operated power grip,” Ernest Autumn Van Den Heuvel, president of TenTonToys/EVERGREENRIVER Media Holdings LLC, told TDmonthly. Launch date: August 2008. This walk bike helps children as young as 2 get outside and learn about balance. Lets them learn to balance by "walking" at their own pace, reducing the number of falls and scrapes. They'll be ready for a pedal bike in no time. Features adjustable seat and handlebars. Unique frame allows even young children to easily mount and dismount. Pneumatic tires and ball bearings keep it rolling smoothly. Full 2 year warranty. This hubless, human-powered ride-on features two wheels set in a straight line on a variable axis. The rider puts sets a foot through each wheel and self propels the Freerider. Launch date: January 2010. Weighing less than three pounds and the size of a rolled towel, the Piggyback Rider bonds parent and child in active transport that is natural and instinctive. 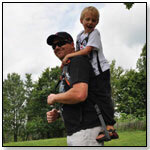 Rather than a seat attached to a frame or wheels, the brothers Jonny and Wayne Lifshitz designed a backpack with a shoulder mounted foot bar for a child to stand on, four integrated grab handles for a child to hold, and a safety harness to secure the child. The foot bar rests just below adult waist level, allowing the child to stand perched on the adult’s back and be engaged in active transport, rather than sit (and fall asleep). The Piggyback Rider is built strong and sturdy, made with high quality climbing buckles, webbing and a tempered aluminum bar. The foot bar has textured grip tape to ensure traction on the shoes; the child’s harness is clipped to the adult carrier at two points and the back has a neoprene panel for comfort. The entire carrier comes in a convertible multipurpose storage bag/mudflap. 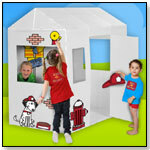 BuildaDream Playhouses give children the gift of creativity. The unique products are lightweight, sturdy and easy-to-assemble with no adhesive or fasteners required. The cardboard is printed with black graphics on white corrugated cardboard made from 80-percent recycled materials, to allow children to decorate with creative accents, making it their own. Roman Town lets the player be an archaeologist and manage a team of diggers while learning about archaeological techniques and uncovering ancient objects. Graphics rendered in 3D let players explore Roman buildings and immerse themselves in Roman history. One can put pots together, exercise puzzle skills with fun mini-games, and find out what archaeologists really do. President of Dig-It Games Suzi Wilczynski told TDmonthly, "Roman Town is unique, educational and, most importantly, lots of fun!" Awards: The Tillywig Brain Child Award; NAPPA Honors; The National Parenting Center 2010 Seal of Approval; Creative Child 2010 Game of the Year Award; Dr Toy’s Best Vacation Product; five 2010 Life Buzz Parent-to-Parent awards.